Living Space: 2970 sq. ft. This 2 bedroom, 3 bathroom home has a very unique style that fits in well with it’s environment. It is located just north of Playa Matapalo and 5 min off of the paved coastal highway. It is halfway between Dominical and Quepos, 20 min to either. It is also 15 min from the nearest airport and hospital. 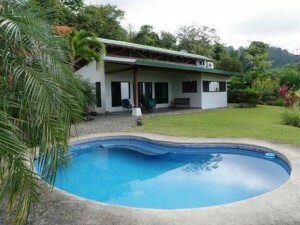 The house sits on 4.5 acres and has spectacular ocean views including all year sunsets and views of Manuel Antonio National Park. The property is gated and the grounds are very well cared for. The house is split into 2 seperate buildings. the first building has the kitchen, dining room, and living room all with an open floor plan, high ceilings, and huge windows to capitalize on the amazing views from everywhere. Then you walk through a covered pathway and gardens to get to the second building which houses both of the bedrooms. Both bedrooms have on suite bathrooms and a/c. In front of the house is a nice lawn which leads to the pool. Behind the pool is a palm thatched rancho perfect for relaxing in a hammock or having a poolside BBQ!! This is a great house and property and it is priced to sell in today’s market! !